Add vegetables and garlic to reserved drippings in skillet; cook 5 min., stirring occasionally. Stir in flour; cook and stir 1 min. Gradually stir in broth. Bring to boil. Add cream cheese product; cook and stir 1 min. or until cream cheese is completely melted and mixture is well blended. Remove from heat; stir in chicken. Spoon into 9-inch deep-dish pie plate or shallow 1.5-L casserole dish; top with bacon. 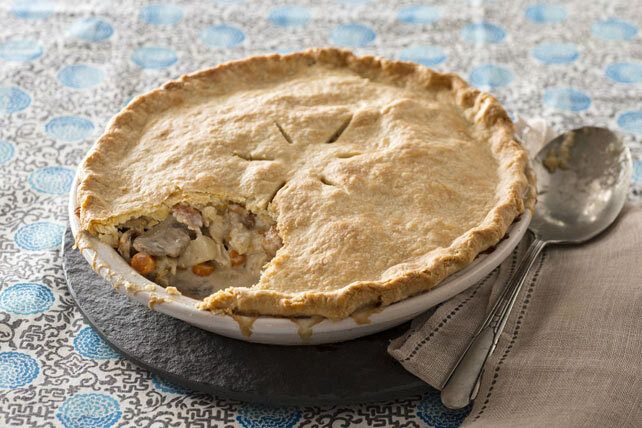 For a delightful brunch idea, serve this Chicken and Bacon Pot Pie with a seasonal fruit salad.